The compound 3-trimethoxysilyl propyl dimethyl octadecyl ammonium chloride is at the core of Zoono. It was developed through research in labs during the Second World War and has been used extensively in the last 50 years. It’s used industrially to kill germs on many popular consumer products, was used by Dr Scholl as an odour preventative in shoes, and is commonly found in many antimicrobial kitchen boards. Zoono technicians have developed this pre-existing compound to make it available for common household use. It’s applied in a 100% safe water-based solution that can be applied to any surface. Zoono doesn’t just kill mould. Because of its ability to break the cell wall of microorganisms, it also kills viruses and bacteria. So your mould protection can also prevent the spread of flu viruses and help protect your family from odour-causing bacteria, leaving your home smelling and feeling cleaner and fresher than before. Manufactured in New Zealand, Zoono® is a broad-spectrum antimicrobial killer proven to be effective against bacteria, viruses, and mould. Unlike other products that use alcohol or bleach to kill, Zoono® kills by 'mechanical' means. This means rather than using a toxic chemical or bleach to kill it works by bonding to surfaces to create a protective shield that continuously kills germs for extended periods. Once applied on surfaces, Zoono® protects for up to 30 days, even after regular cleaning. It has full New Zealand food-safety approval and a toxicity rating similar to vitamin C.
100% non-toxic Zoono® can be safely used around people, pets, and plants! Tested and proven internationally, the Zoono® range is a completely safe and non-toxic solution for remediating mould and preventing the spread of germs. So how exactly does Zoono® work? When sprayed on a surface, Zoonocide forms an invisible, transparent, and durable antimicrobial film, which is bonded to the surface. The active ingredient in Zoono® is 3-trimethoxysilyl propyl dimethyl octadecyl ammonium chloride. It kills microbes using lysis, the disruption of a micro-organism’s cellular membrane. 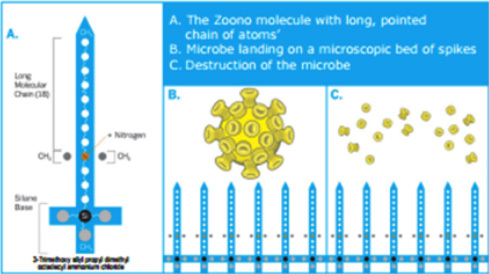 The Zoono® molecules form a microscopic bed of molecular spikes. These spikes are long, pointed chains of atoms that pierce the cell walls of various microbes causing the micro-organism to die. Zoono® works in a totally different way to conventional antimicrobial solutions. It kills and inactivates microbes by piercing them with microscopic spikes rather than by poisoning them. Most conventional antimicrobials are consumed or use up their ability to affect the micro-organisms in a relatively short period of time. The spikes created by Zoono® retain their effectiveness after contact with micro-organisms, similar to a sword that is capable of repeated use. The mechanical rather than chemical destruction of microbes also removes risk of micro-organisms acquiring immunity and becoming resistant. Unlike older-generation quaternary ammonium compounds, Zoono® is chemically bonded to the surface by a silane polymerisation technology. Zoono® is a water-soluble monomer in solution that converts on application and dries to a bonded polymeric, insoluble surface film. The silane proportion of the Zoono® molecule allows it to become part of the surface itself. This gives the product its longevity, as the active ingredient resists being washed off, and it is not de-activated by bacteria or other pathogens. Just one application of Zoono® has been shown to protect surfaces against micro-organisms for extended periods of up to 28 days, without the need for reapplication and irrespective of how many times the surface is washed down. This provides unprecedented protection and is a distinct point of difference from any other method for killing or preventing the spread of germs. Industrial usage case study here.